Can I Sell and Buy a Home at the Same Time? Back in the late 70's when I started in mortgages, it was fairly commonplace to have "domino" closings take place. That meaning multiple buying/selling transactions, each dependent upon an earlier one, successfully take place. One initial Closing kick-started all subsequent Closings. 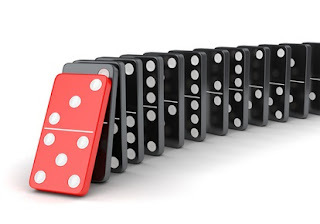 Like the chain reaction seen in dominoes, each took place in a close time frame, one quickly following another. The Sellers at one Closing became the Buyers at the next, and so on. This happened so frequently back then that I didn't think much of it. It was normal. But the frequency with which this happened grew less and less. It came to a grinding halt during the downturn of the late-2000's housing crisis. Understandably so. Closings, in general, were far fewer in number. Sellers became restrained in their ability (and also less willing) to tackle the financial risks associated with these tandem transactions. Currently, many markets across the U.S. have improved. Although the healing has been slower, I'm once again receiving financing questions from Chicagoland homeowners that are confident enough in their abilities to sell, or at least sell within the timelines of their purchase contract, to want to enter into these types of scenarios. If that describes you, and you're thinking you would like to sell your Chicagoland home at the same time you're buying another, be aware that many things must fall into place properly for you to do this successfully. The timing with which these things happen is important. Again, just like in dominoes. So what are these "things"? ALL of the above factors are pre-requisites to financing Approval. So it's important that you, as a step-up Buyer, consult with a Lender (and an Agent) before assuming you can afford two mortgages ... or enacting a sale or purchase. Although "contingent" offers are increasing in number once again within some housing markets, hopeful Seller/Buyer/Borrowers can't afford to assume anything in this situations. You can't assume you can handle the risks faced within these scenarios. Or the probability that your offer will be viewed positively by Sellers. I've written before regarding the importance of good communication between all parties (client and professional) involved in a real estate transaction. It takes on heightened importance with the more challenging selling/buying scenarios, such as the one talked of above. Simultaneous selling and buying of Chicagoland homes can be successfully accomplished. While elements of these scenarios are different and unique, one thing is shared by all. A hopeful Seller/Buyer/Borrower needs to get their "ducks in a row". Obtaining a thorough, detailed analysis of your individual scenario ... including all the critical factors listed above ... well in advance of starting your selling/buying journey, is a critical step towards finding success. Very good points Gene Mundt, IL/WI Mortgage Originator - FHA/VA/Conv/Jumbo/Portfolio/Refi about buying and selling. The purchase contract with a contingency clause for a seller to consider that the buyer's home has to sell first puts stress on the Seller, but they do still happen and go through. The Seller has to become with familiar with the buyer's home and market conditions for the home that the buyer is selling. Gene- I can remember the domino closings from years ago. Buyer's should be aware as well as consult with you if they are considering this. Gene we still do quite a few simutaneous closings. Have 2 going on this next week and so far all is on track with all parties - which is a lot of people! Communication is critical for getting these transactions to closing. Excllent post! Excellent blog, Gene, as always! I have had people sitting nervously at the closing table waiting for funds to hit their account. The dreaded "wire"--I always try to space it out a few days. This was a great read! Gene, If dominos were ducks people need to get them all lined up tightly in a row to ensure they can buy a new home after/when they sell their current home. I've talked with so many people that "believe" getting a loan won't be an issue because they "know" they can afford the payments. It does not work that way! Another Great post Gene Mundt, IL/WI Mortgage Originator - FHA/VA/Conv/Jumbo/Portfolio/Refi - so glad to see it Featured. This is standard in the U.K. I have no idea how anything gets sold because of the chain that can exist. I would love to know how deep and how long it can go. With our shortage of inventory and heavy demand a contingency sale is a long shot. Hi Gene - Good advice! We have lately seen just a few contingent contracts get accepted, after many years when they just weren't possible. Each of those involve a contingent sale in a very hot segment of the market and a purchase in the upper end, where things are moving more slowly. Rare for my mostly second home market, but oddly enough we've had two this year and they both worked like clockwork. Those domino closings can get very precarious. I was involved in one on the sale of my first home. All turned out well, but not without some fancy foot work at the end. Thanks for the post. Gene it was a balancing act before TRID when it came to buying and selling a house on the same day, but since TRID that balancing act has become more like walking a razor thin line. This is very scary for many buyers - so many things can go wrong. The right lender (you!) makes all the difference is shepherding the deal successfully. Good info, this is coming up more often for me too the last year or so. This can be stressful, but doable. You have to have an agent who knows what they are doing and a great lender. An outstanding post . . . . Thanks for sharing your insight. Congratulations on earning a gold star feature on an outstanding post. Gene Mundt, IL/WI Mortgage Originator - FHA/VA/Conv/Jumbo/Portfolio/Refi = it was possible and I have done a few - buying and selling on the same day. I've only done one sell/buy in one day this year - it took the involvement of attorneys, buyer, seller, agents, mortgage contacts and more. It's possible, but tricky. Excellent post and very important information about those contingent closings and what is necessary and involved. I love the post and will share it with others. Congratulations on the feature. I've done only a handful of back to back closings in my career. There are plenty of people who cannot afford to buy another house without selling their current one, and getting a contingent offer accepted is very difficult in our seller's market. Interestingly, I did 2 last year, and just got my 3rd one of this year accepted yesterday. One deal I am finishing up had a double contingency! Great stuff here, Gene, as always! Hi Gene. We've now entered a period where more sellers are willing to look at contingent offers, though many buyers are not willing to put their existing home on the market for fear of not finding a replacement because of the low inventory. Oh yes, as a mortgage underwriter in the UK, I remember those long chains, sometimes 10+ homes changing ownership one after the other. I was often in the middle of them as an owner too. It worked, it still works, it's the norm there. Here, different story entirely but buyers of the new may not realize they cannot just say, it's Ok I can afford it. You have to show or it's a no go. A great agent and loan officer combo can certainly help all involved to understand all of this. Hi Gene Mundt, IL/WI Mortgage Originator - FHA/VA/Conv/Jumbo/Portfolio/Refi , Funny that you shoud mention that. We have one like that next Friday. A couple is closing on their home they are selling and also closing on the one they are buying. Good morning Gene. I took this topic on a couple of different times, but not a simple answer. Nice job the way you handled your post. Good Morning George - I remember those days although I was not one of those who did it in the same day. So much has changed. Excellent advice. Today's market is full of challenges and working with a professional Realtor and lender is the key to a successful transaction!